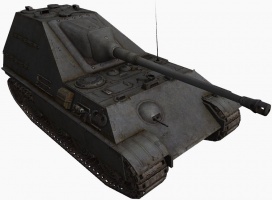 The Jagdpanther II is a German tier 8 tank destroyer. The Jagdpanther II, along with its cousin, the Ferdinand, are two of Germany's three non-premium tier 8 tank destroyers. Possessing the same 12,8 gun, they are all extremely powerful and pack a great punch. 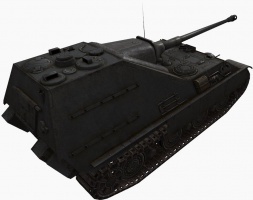 It has a very thick and sloped frontal casemate armor that can bounce even Tier X shells. It is also much faster than most Tank destroyers of its tier, due to its powerful engine and good ground resistance values. Keep in mind though, the hull armor is still quite thin, and to best utilize your tank you should employ ambush or sniping tactics, using the element of surprise as your weapon. The JagdPanther II will be able to inflict substantial damage and dart away before the enemy gets a clear shot. With proper use, the Jagdpanther II can become a fearsome opponent. Many players compare this tank with its twin, the Ferdinand as it carries the same guns and has (almost) the same reload time, but the Jadgpanther II puts emphasis on its Maneuverability over hull armor allowing it to move and relocate surprisingly fast on the battlefield, while being much faster than the Ferdinand. It doesn't have a very good gun traverse and gun depression (compared that of the Ferdinand), requiring to move more often to readjust the aim against an enemy, but it makes no less of a threat. The Jagdpanther II leads to the Jagdtiger. The JagdPanther II is a very versatile TD, much more so than Ferdinand. It can fit and perform adequately in pretty much every situation. It's not limited to sniping and supporting the main force like typical tank destroyers, but can also be used as a brawler and flanker if needed. You can even wolfpack with mediums and support them with your firepower if you want. The 128mm gun can easily penetrate any tier 8 and below without any trouble. Another good thing is because of your agility, it is very hard for a medium tank to circle. However do note that its weaknesses which is its tall stature and poor hull armor. Due to its size, it has mediocre camouflage value (on par with same tier mediums) and thus it is easy to be spotted. 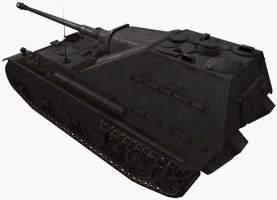 Its armor is similar to that of the Panther II however due to the fact that it is a non-turret TD, you are unable to angle while returning fire. Your only hardpoint is the casemate, at 150mm sloped back at 60 degrees, it is a very tough nut to crack. Abuse hulldown positions and/ or elevated platforms, enemies will have a very hard time damaging you while you punish them with your high alpha. Overall, it's a very fun tank to play, and in the hands of a skilled player that knows how to maximize its strength, it is easily one of the most feared tank in tier 8. Research the the 12,8cm PaK 44 L/55. Go for the upgraded engine. 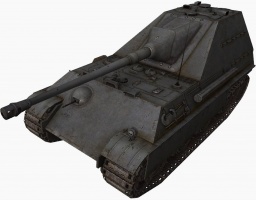 The Jagdpanther II was conceived in November of 1944 by Krupp to up-arm the Jagdpanther with an 12.8 cm PaK 80. Since it was impossible to mount the 12.8 on the Jagdpanther in its current layout, Krupp redesigned the Jagdpanther with a new crew compartment which was to be very cramped. It was to weigh 51 tons and was to have a long reload. It was cancelled because the Jagdpanther with the 8.8 L/71 was more than adequate. 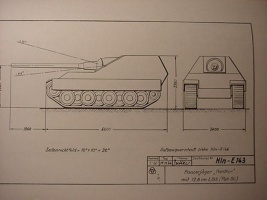 It is a myth that the Panther II chassis was to be used for the 12.8 armed Jagdpanther, as the Panther II was cancelled months before the 12.8 Jagdpanther. In fact, the designation "Jagdpanther II" was never used for this vehicle. Instead, it should be called the Jagdpanther mit 12.8 cm PaK 80. The Jagdpanther II's actual name is, Jagdpanther mit 12.8 cm Pak 80. This tank destroyer was developed on the basis of the Panther hull, not Panther II. The actual Jagdpanther II project was simply a Jagdpanther, but based on the Panther II chassis. The Panther II project had been dead for around a year before the Jagdpanther mit 12.8 cm Pak 80 project began. Panzer Tracts 20-1,Jentz & Doyle, pg 49, Panzer Tracts, 2001. This page was last modified on 1 May 2017, at 22:57. This page has been accessed 309,585 times.